Board index Facebook Fridays! - Free LMCCo Product Giveaways Every Week! 2017 Facebook Fridays! It's Facebook Fridays! for June 9, 2017, and we want to acquaint you with the cultural history, magical beliefs, divination techniques, and practical spells of Mongolia, Manchuria, and Siberia. The Lucky Mojo Curio Company is holding a random drawing to give away 5 copies of David Borji Shi's first-of-its-kind folk magic guide, "North Asian Magic," which will teach you the cross-cultural spell-casting methods of a region inhabited by indigenous, nomadic, sky-venerating shamans with a bivalent tradition of Vajrayana Buddhism. (Betcha didn't know that, didja?) 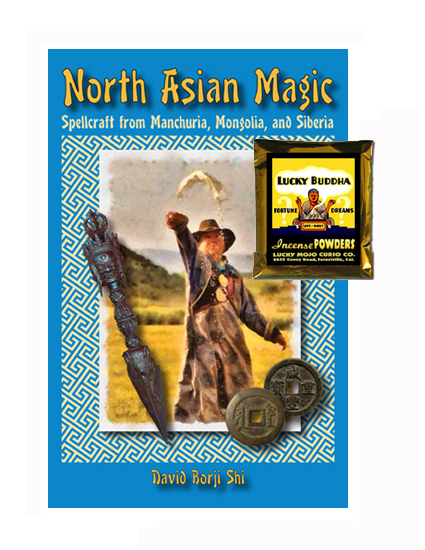 Each book comes with a packet of hand-made Lucky Mojo Curio brand Lucky Buddha Incense Powders to enhance your practice of North Asian spells for love, luck, protection, and healing. First thing tomorrow morning, we will select FIVE winners at random, announce their names here, and ask them to message this Facebook Page with their mailing addresses, so we can send them their FREE North Asian magical products. We have a winner! In fact, we have 5 lucky winners! Our Facebook Fridays! winners for June 9, 2017 are: Gayle P. Coleman, Jasmine Bellamy, Jackie Yacono. Art Zeiber, and Mary Taylor.